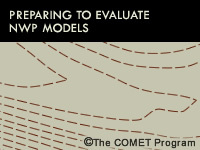 This lesson prepares the forecaster to evaluate NWP analyses and forecasts using physically based conceptual models of the atmosphere, and the "Vertical Phenomenon Analysis Funnel". This funnel divides the atmosphere into three sections: lower stratosphere and tropopause, mid-to-upper troposphere, and lower troposphere. We discuss tools to use and atmospheric features to assess for each section of the atmosphere, using interactive case examples, and summarize the methodology with a comprehensive example. Finally, we compare model capabilities and the time and space scales of assessment tools used to evaluate NWP analyses and forecasts. Proper interpretation of NWP in the forecast process is critical to the future success and relevance of NWS meteorologists. This course challenges the operational forecaster and is not fluff. Forecasting is changing, jump on board now.